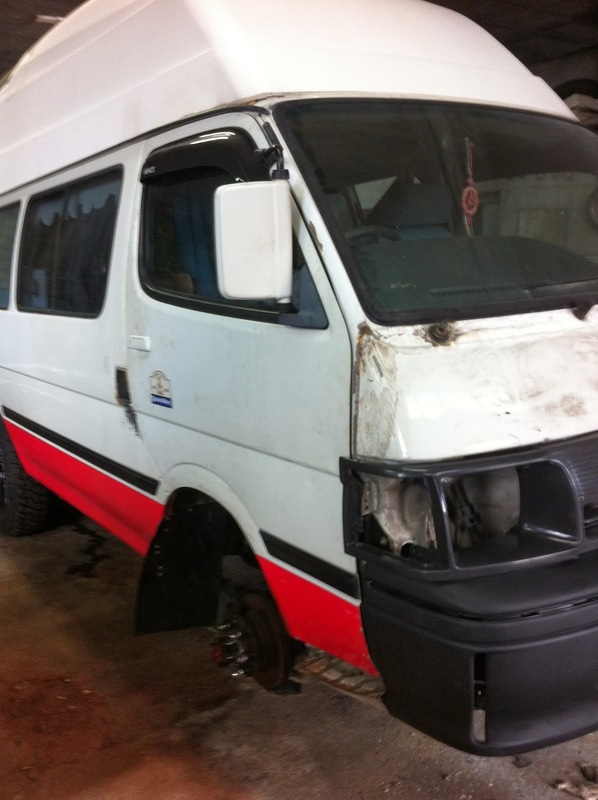 I got these photos of my van sent through from the mechanic today. I'm still waiting for the repairs to be completed and asked for some photos. 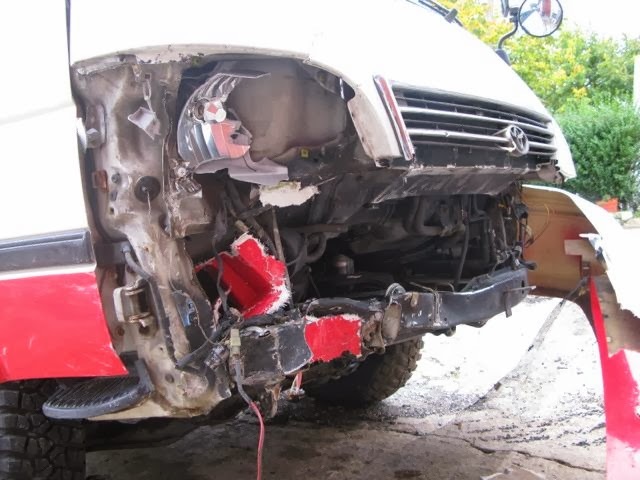 It seems that the main bodywork repairs are done - it just needs painting and assembly now. The first picture shows the drivers side door. It was not closing properly after the accident as the hinges were all crushed in and the door was bent. Looks straightened out ok now. It also looks like he's fixing a small area where there was a bit of rust behind the drivers door around the air intake, that was not caused in the crash.. Here's the front of the van. 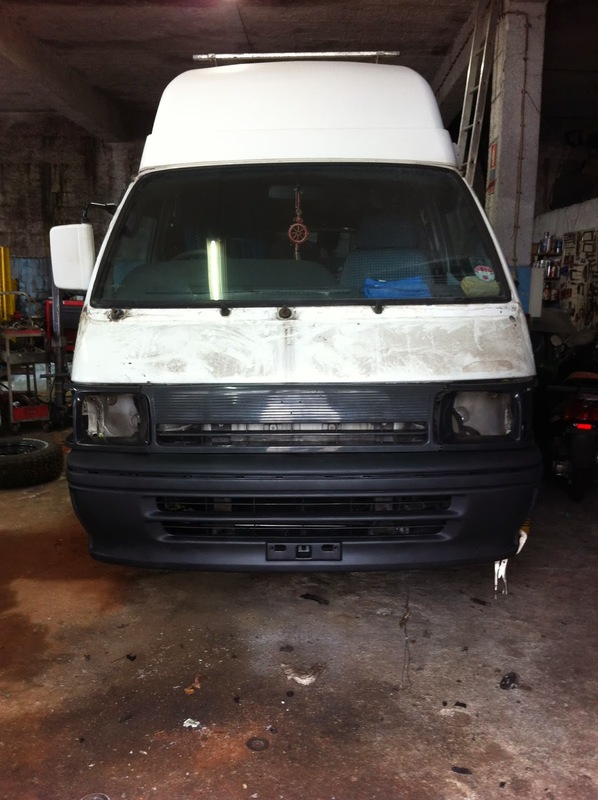 If you compare it to an original picture of the van, you can see that he has had to trim the bodywork in order to make the euro style front light grille to fit. The original headlights were sculpted into the front bodywork. I was wondering how this would be done, and here it is.. Compare with the original picture on the right, under 'Welcome to Hiace Hobo' and you'll see what I mean. They reckon it'll be ready by 11th February - I certainly hope so, its been taking quite a while already. From these photos it appears that there isn't much left to do though. As a reminder, here's the original picture taken just after the crash.. It'll be good to get back on the road again, and be able to share a lot more camping/travel posts, and make more videos from the van again. I've been quite limited in where I can explore under the circumstances, apart from a few day trips with the family I am staying with, and going for bike rides along the coast. Still there is a lot to enjoy, and of course no winter to speak of. Its already like spring here - lots of rain, many flowers blooming, birds singing, frogs croaking in the trees, and yesterday I saw the first House Martins arriving. Things are going fine here, I am now doing a lot of web based work and helping to establish some online businesses, as well as my gardening and maintenance around the villa here. Though unrelated to the van lifestyle, I'll share the websites here if you're interested to see what I've been working on. Give them a thumbs up on Facebook or G+ if its up your street. Thoughts on the New Year..